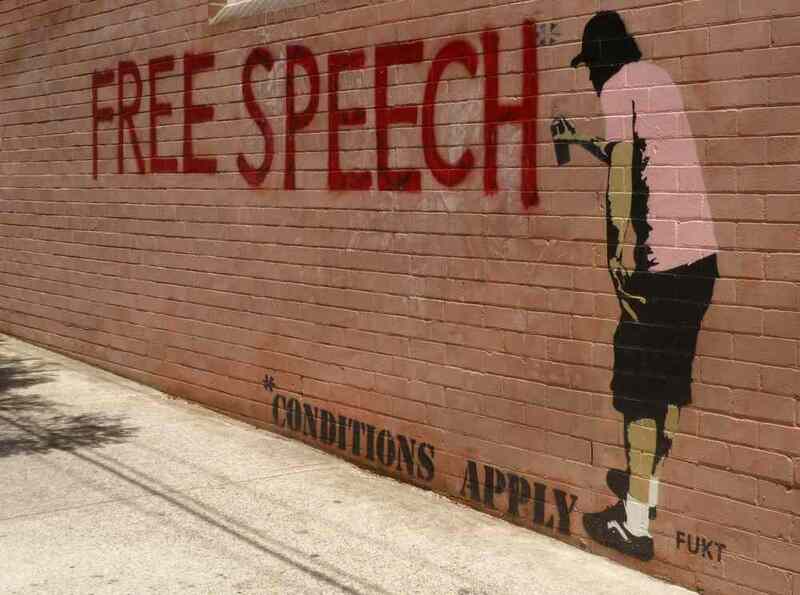 Home / Articles / Who should be free to speak? It is understandable that this particular freedom is held so dear. It stands in stark contrast to the oppressive ‘thought police’ dictatorships that heavily restrict any kind of free expression. Nobody wants that. Furthermore, many feel that without a free press who will keep check on our leaders? We need to be informed of their transgressions, should there be any, as well as be given the benefit of critical scrutiny of their policies. The press often pour obloquy on others, but is this their God-given right? Certainly they are not always correct in their assessments. Recently that august institution The Sunday Times had to pay sizeable damages to the McCanns, whose child was abducted in Portugal, after publishing falsehoods about them. Such cases are not at all infrequent. The press are not on the highest moral ground, many of them freely promoting (as well being paid to promote) all kinds of vice in their pages almost every day. Nor are they likely to be consistently objective in their analyses, being sold out to various vested interests that pay their salaries. Everyone knows how the papers all have their different political and corporate affiliations. Like the religions they often criticize, the media also has its own assumptions about what is right and wrong. Commenting on offensive cartoons published a few years ago, French newspaper Le Monde said, “Religious commandments and prohibitions cannot take priority over the laws of the republic. Religions… can be freely analysed, criticized, indeed ridiculed.” In other words, for them the “laws of the republic”, as made by men, are the absolute authority. In fairness, some sections of the media are trying to point to what seems to them like nothing more than hypocrisy and cheating. There is certainly enough of that around, but who should do the pointing? Should this be entrusted to journalists? Are they fit to provide the necessary checks and balances in our society? The Mahabharata, which gives the history of ancient India, describes a societal system where such checks were intrinsic to its design, but they were made by the state, not random individuals whose one qualification might be an ability to write. This Sanskrit text tells how the kings of those days were responsible to ensure that religious leaders in their jurisdiction properly behaved. These kings were in turn guided by pure-minded saintly persons who were free from material desire and therefore the tendency to exploit and deceive. The idea was that only those who are actually free should practise freedom of speech. Those still in the thrall of the material world cannot be fully trustworthy, as they are liable to be carried away at any time by sensual and mental urges. Only the spiritually pure can resist such pressures and act for our best interests. They also know how speech should be properly employed for everyone’s benefit in order to bring about peace and happiness. If the press really do want to render us some good they would perhaps do well to take a hint from this, giving more of their column inches to uplifting spiritual narratives. Hopefully then we will see more peace prevailing, and less tragedies such as the recent events in Paris.